Courtney Desire Parker, daughter of Robert Parker andMark and Paula Gentry, and Robert Lee Allen IV, son of Bobby and Stephanie Allen, exchanged vows April 7, 2018 in an intimate and lovely ceremony at East Ivy Mansion surrounded by close friends and family. Courtney, a native of Savannah, Tennessee, attended MTSU and Cumberland University; she has a Masters of Science in Nursing degree from Tennessee State University. A member of Chi-omega sorority, Courtney is employed by Murfreesboro Medical Clinic where she is a Cosmetic Dermatology Nurse Practitioner. The groom is from Ooltewah, Tennessee, and a graduate of MTSU with a degree in concrete management. He is also a part of the Greek world being a fraternity brother of Sigma Nu. He is employed as a project manager with Certified Construction Services. In sharing the story of how they came to be as a couple, Courtney says both she and Rob had “known of ” each other but didn't know each other well enough until running into each after a MTSU game as alumni. The following week, Rob was moving to Dallas. While living there, they would talk casually. He came home to attend a friend’s wedding and decided to bring her as his date. After the wedding, they became closer and their relationship began. After about eight months, rob moved to Chattanooga, then found his way to Nashville to be with Courtney. In reminiscing about the proposal, Courtney describes it as being magical. They were in Michigan skiing where rob has planned to propose. Although Courtney likes to ski, she says isn't a pro. During their ski outing, she fell and busted her nose so, rob decided to postpone the proposal until the next day. The actual proposal happened after they were driving along lake Michigan with their best friends ( who were in on the plan). They decided to stop at a pier to take in the beautiful landscape and lake ice. Rob took Courtney out on an iceberg and got down on one knee. Courtney was very surprised, she had no idea it was coming. She recalls it being one of the most special moments of her life. They celebrated all evening in downtown in Grand Rapids, Michigan with friends while face timing all of their loved ones back home to share the good news! 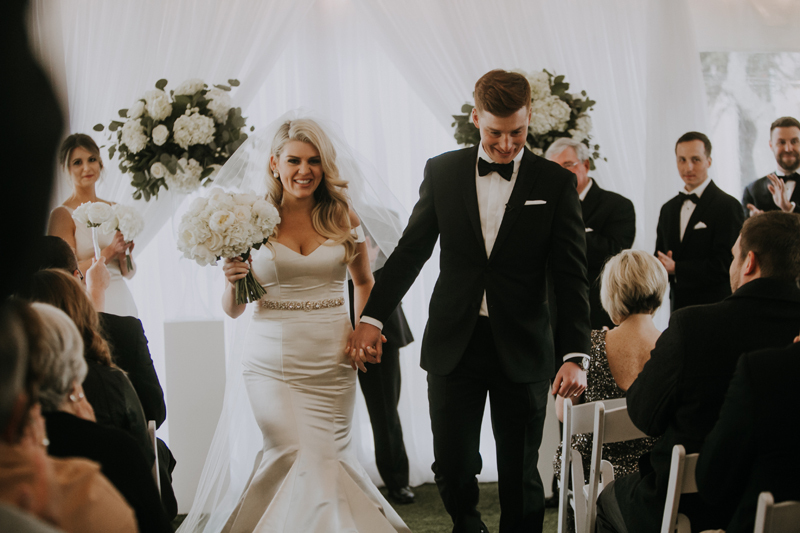 In planning the big day, Courtney said it was important when picking a venue that their guests felt as if they were in an intimate setting while celebrating with the couple. The ambiance was elegant, glamorous, and timeless. Rev. Todd Kettner officiated the ceremony. He took time getting to know the couple through pre-marital counseling. During the ceremony, he shared their love story from start-finish. Multiple people commented that it was one of the best ceremonies they had witnessed as it was intimate, sweet, and hilarious at times. The elegant ceremony was held on the back patio near a garden and pool; it was under a large white enclosed tent that had white drapery lining the inside. The alter was lined with white roses and peonies with greenery. Courtney had 11 bridesmaids and Rob had 10 groomsmen (including Robs father as his best man) standing by their side. The bride’s dress was a satin Olia Zovazina off the shoulder, trumpet style gown. There were fresh water pearls streaming midline from the back down to the train. Her diamond and pearl earrings were new, her garter was something borrowed, and her mink fur was something old from her grandmother. The reception was held at a glamorous Italian style mansion, East Ivy Mansion. The cake was four-tiered with white roses on top. It was red velvet, vanilla, and strawberry. DJ Brandon Rolland provided entertainment. Their first dance was by Wade Bowen: “Who I am,” (Texas Country). She says that it was the most special day of her life considering she married the man of her dreams and had every single person they both hold dear to their hearts in the same place at the same time. The couple honeymooned in St. Lucia and currently reside in Nashville, Tennessee.